Bathrobes are wonderful to snuggle up in at the end of the day, on the weekend or if you are hosting sleepover company. If your bathrobe needs a new look, has a sash that has gone missing or a button or zipper front, you can easily make a sash for a new look. Making a bathrobe sash is a simple sewing project that takes less than an hour. For robes that did not originally have a sash, you can add simple belt loops to hold one. Cut two strips of sash fabric, 5 inches wide by 36 inches long. The length of the strip follows the grain of the fabric. This will prevent the sash from twisting when stitched. The grain of a cut fabric yardage runs from cut end to cut end, not selvage to selvage. Place the two strips together with the right sides facing. Pin one short end together. Sew the pinned edge using a 1/2-inch seam allowance. Open the sewn strip and iron the seams open. The strip should now be 71 inches long. Fold the strip in half, with the right sides together and matching the long edges. Pin the the edges together. 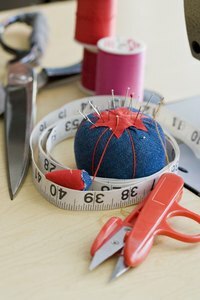 Sew a 1/2-inch seam allowance along the pinned short ends and the pinned long edge, leaving a 4-inch opening in the center of the long edge. Clip the corners and turn the sash right side out through the 4-inch opening. Iron the sash. Pin the opening closed. Topstitch around all four edges of the sash, 1/4 inch from the edges. This will close the opening in the side and finish the sash. Cut two lengths of 1 inch bias tape, 5 inches long. Fold one bias tape piece in half, matching the long edge. Iron the fold and pin. Topstitch along the length, as close to the pinned edge as possible. Repeat with the remaining bias tape piece. These are the belt loops. Open 1/2-inch in the side seams of the bathrobe, 6 inches below the armholes, using a seam ripper. Fold one belt loop in half, matching the short ends. Insert the short ends 1/2-inch into the 1/2-inch opening on the side seam. Pin the seam on the inside of the bathrobe. Stitch the inside seam closed and securing the ends of the loop. Repeat with the other loop. For a child's bathrobe sash, simply reduce the length so that it does not cause a tripping hazard or drag on the floor.